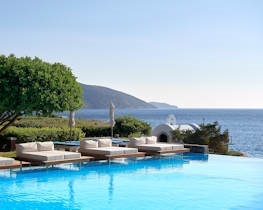 Adult only Minos Palace Hotel & Suites boasts an exceptional location on a peaceful and rocky headland overlooking Mirabello Bay about 2.5km from Agios Nikolaos. A particularly well-run deluxe hotel with a laid back ambiance it benefits from extensive, mature and beautifully landscaped gardens amongst which much of the accommodation is situated. There is a choice of tastefully appointed guest rooms, plus minimalist style suites with shared or private pool; all enjoy sea views. The beachside all day lounge bar restaurant is perfect for lunch, drinks and fine dining sea view dinners, whilst Amalthea offers a buffet breakfast and a varied evening buffet of Greek and international dishes. 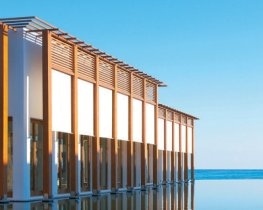 At the heart of the hotel is a large, inviting pool and there is a small sand and shingle beach and rocky sunbathing platforms along the shoreline. Evening entertainment is low key and there is a bijou spa with massage treatments. This hotel is only suitable for adults and does not allow children under the age of 18 years. Complimentary Room Upgrade(dependent on availability), Breakfast in Room after 1st night stay (service charge excluded), Chilled Wine & fruits upon arrival, Complimentary Late Check-Out until 14.00 (dependant upon availability). for bookings made between 18 April 2019 and 03 November 2019 and arrivals between 20 April 2019 and 03 November 2019. Prices apply to all rooms.. Wedding Certificate required.